Daphne's Adventures: Of course they're scissors! 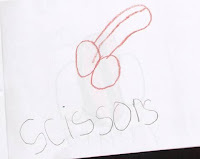 This is my kindergartner's artistic rendering of a pair of scissors. I wonder what his teacher thought. I allowed myself just a small smirk when I saw it. I waited until he was out of the room until I started crying from laughing so hard. WELL, OF COURSE THEY'RE SCISSORS! I had to call GG in to see this one. Too cute. Oh now that is too funny! How you managed not to laugh in front of him is amazing.